For those of us who grew up in the Sixties, July 20, 1969 will go down as the most inspirational day of our lives. We gathered around our TV sets in wonder as Neil Armstrong spoke these immortal words, “That’s one small step for man, one giant leap for mankind.” Our nation was brimming with pride. A mere eight years earlier, America’s new and charismatic president had a vision. As far-fetched as it seemed at the time, JFK challenged Congress to support an initiative to put a man on the moon (safely returned) by the end of the decade. Amid a pool of skeptics, the vision was cast and NASA would successfully achieve this unimaginable mission with months to spare. It was one of the greatest moments in world history. Question: would this have played out as it did if JFK hadn’t offered his bold vision? Not a chance. It illustrates so well why history’s greatest achievements and admired people are guided by an inspiring vision or purpose. We might not be in the same league as JFK, Lincoln, Jobs, Disney, Edison, Franklin, Columbus, Mandela, MLK, Gates, Graham, or Mother Teresa, but in our own ways, we can all live with vision, too. And when it comes to training our younger generation, it’s one of the most important leadership lessons of all. During the high school and college years, a young person’s focus is clearly on the next step and specifically, on their eventual careers. While this is understandable, it can be argued that a more holistic approach to vision casting is essential. After all, a career is only one aspect of our lives and many if not most people change careers several times. What difference would you like to make in this world? Describe your dreams. Whose lives inspire you the most? How can your passions and interests intersect to have the greatest impact? How will you define “success” in your college years? What will you like to have accomplished in terms of academics, career, credentials, experiences, skills, relationships, and personal growth? Knowing that the career decision needs to be one of the most well-researched in life, describe your 1) interests and passions, 2) natural skills and strengths, 3) personal preferences (on the job and in the working environment), and 4) ability and willingness to fulfill training requirements. What perspectives can help determine that the careers you’re considering would be a great match for your skills and interests? Reflecting on your passions and talents, what are some ways you can serve humanity? What problems, community needs, and people groups do you feel most drawn toward? When have you felt most fulfilled when helping others? What are your hopes and dreams when it comes to family? What do you consider the most important elements of a strong, healthy, and purposeful marriage and family? What qualities will you be seeking in a lifelong partner? What are the traits of the person you wish to become? As the young people in your life develop answers (and some guesses!) to these questions, it’s important to emphasize that our vision evolves over time…few are cast in stone. The key is cultivating a visionary mindset that reflects their entire life and recognizing that each vision is uniquely valuable. No one’s vision is their vision and no one can impact this world like they can. Great leaders live with vision. It’s a question every parent, educator, and mentor has likely pondered as the children under their guidance prepare for their launch into the real world. They’ve offered love, security, wisdom, and training and have left indelible marks on these young adults. They’ve contributed to their leadership foundation, and soon the strength of that foundation will be put to the test in the game called “life on your own.” Many, if not most, of these young people will be landing in a new environment, awestruck like Dorothy when she entered the land of Oz. As authors of What I Wish I Knew at 18 leadership/life skills resources, we are honored to prepare tomorrow’s leaders with the wisdom and strategies they need to successfully transition into adulthood. Through our contacts and speaking engagements, we’ve partnered with many people and organizations who are deeply committed to training up the next generation. One of our favorites is FCCLA—Family, Career and Community Leaders of America. FCCLA is a national Career and Technical Student Organization that promotes personal growth and leadership development through Family and Consumer Sciences education. In the past four years, we’ve participated in their national conferences as exhibitors and speakers and always leave inspired by the well-rounded leaders they are building. We wish every student at every school could participate in their programs! 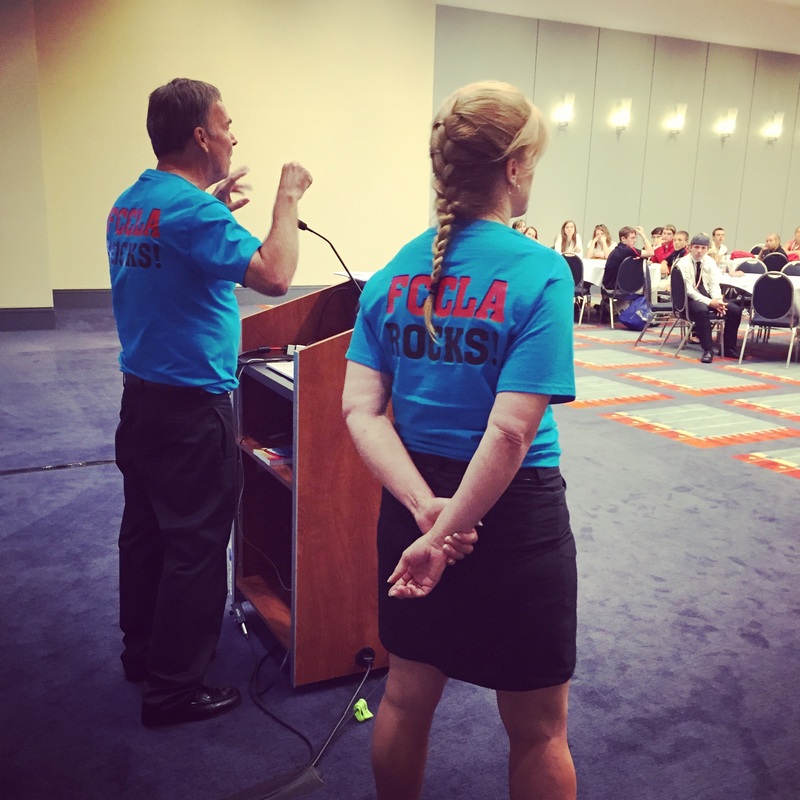 At this year’s FCCLA national conference in Washington D.C., we received a special invitation to speak to high school seniors who will soon begin their adult futures. We delivered our talk, “Leadership for a Lifetime,” to a packed house of motivated students ready to take on the world! We shared nine essential leadership themes that will serve them well in the near future and throughout their lives. Inspired by their feedback, we decided to share these leadership concepts in a nine-part series beginning next week. It’s our hope that this blog series will serve you as parent, teacher, mentor, or student, and that you’ll spread the word to others in your personal and professional spheres. We’re all in this together! Our leadership theme for next week: VISION. Catch you then! Every relationship goes through its ups and downs. For parents, the teen years provide more opportunities for conflict and stress within your household. Teenagers are processing a lot (they’re changing physically and emotionally, discovering their passions and goals, planning their future, etc. ), while parents are trying to transition from control to influence. Often, a certain tension permeates the air as launch time approaches. As our children transition toward adulthood, changing our filter from instructing to empowering should happen incrementally. We increasingly assume the role of influencer and encourager, rather than director, so our relationship and communication should adapt accordingly. Because our children and our roles are undergoing such significant transitions, it’s important to keep in mind our key relational and communication goals, especially during times of conflict! With these goals in mind, we can help keep the “fireworks” at bay and ease some of the tension that may be rising. Strive to build an enduring relationship based on mutual trust, respect, and understanding. We must be viewed as a safe place for them to share their dreams, hurts, challenges, and disagreements. Replace “talk to” with “share with” in your filter. Promote self-discovery and responsible decision-making, even if it comes with risk. Mistakes are a necessary part of the growth process. As we seek to empower rather than control our children, certain words should govern our behavior and occupy our communication filter any time we talk with them: influence, ask, listen, invite, respect, understand, encourage, share, and inspire. These are especially helpful to keep in mind when strains and conflicts rise and when our children are making difficult decisions. Share your views in love. Do not be harsh or critical. These strategies can help take some of the sting out of your difficult conversations and help your teen understand that you are trying to empower them, not control them. While having strong communication goals are important for parenting children of any age, they’re absolutely essential when raising teens and young adults. Consider whether your communication methods influence and empower, or direct and constrain. When tensions rise in your house, how do you handle it? Do you have any great communication strategies to share? Remember, we’re releasing eagles to soar, not kites to control! What does it take to land a great job, make wonderful friends, open doors in your career field, or land lucrative accounts for your employer? When you think of the qualities that might help you get ahead, the first things that usually come to mind are intelligence, experience, reputation, connections, and maybe even luck.. But here’s the deal…when it comes to soaring in your career (and in your life! ), the secret sauce is enthusiasm!. Enthusiasm may seem like a “lower order” attribute compared with these other credentials.. However, many times a job candidate’s enthusiasm is precisely the deal breaker in choosing one of two equally qualified applicants, or what sways a potential client to selecting their supplier. Everyone wants to work with someone who is excited to be there! I believe that enthusiasm is a secret ingredient for accomplishing great things. During my investment career, I gave countless presentations to multi-billion dollar sales prospects. After careful observation and coaching from our company’s best marketers, I developed quite a reputation for telling our story. I was told it was my enthusiasm that set me apart from my peers. I passionately believed in our company and its services, and I made sure our prospects could tell! Ultimately, it made a significant difference to our sales success. It was a critical element in my job interviews, too. People who exude positive energy and enthusiasm are infectious. They inspire others with their spirit and obvious love of life. They motivate everyone around them to do and believe the best, and it’s a key ingredient they pass on to employees. in a job interview, know the company and position like the back of your hand and demonstrate your interest with compelling questions, high energy, and full engagement. Don’t let anyone be more enthusiastic than you! always discuss work-related issues in a positive and upbeat way and be solution minded. Whining doesn’t exist in your vocabulary! show up on time—early, even! Whether it’s simply enjoying the company of others or interviewing for the most significant career opportunity of your life, show your enthusiasm. It WILL make a difference! How differently do you feel around people who are positive and enthusiastic versus those who are low energy or negative? Have you made a point to be enthusiastic at your workplace or in school? If so, has it helped your success?